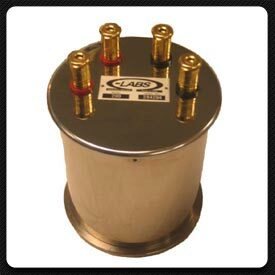 200 Series - 0.1 ohm to Ten Megohms | Ohm-Labs, Inc.
Ohm-Labs' 200-Series Reference Resistance Standards are designed for maintaining the ohm at levels from 0.1 ohm to ten megohms. Each standard is individually wound from selected Evanohm alloy wire, which has been carefully heat treated for low temperature coefficients of resistance and processed for long term stability. At 100 K and above, a polycarbonate top reduces potential leakage errors. This style includes guarded BPO connectors, which connect to an internal guarding structure. These models may be used as 4-wire, 2-wire or guarded standards. An internal 10 K thermistor temperature sensor is also included. Initial tests on one ohm standards (model 200) have shown stability of <0.1 ppm / year, and (alpha) temperature coefficient of <0.05 ppm / °C at 25.00 °C, with no measurable barometric effect. Each standard is individually manufactured, and can be supplied optimized for 20, 23 or 25 °C. Oil-filled and hermetically sealed, these standards are highly immune from changes in barometric pressure and relative humidity. All models include ISO17025 accredited calibration, with temperature coefficient data. In addition to decade values, the 200-Series are offered in –T values for thermometry, and –Q values for use with a Quantum Hall System. Special values are available upon request. Current Typical Coefficients Initial 12 mo. Temperature coefficient is at specified 20, 23 or 25 °C +/-5 °C.